our easy-to-read Boston travel guide. The Must-See Sights You'll Love"
After several years of developing this website, I discovered its biggest problem... There is so much information that keeping track of your options and actually choosing what to do on your Boston vacation can be overwhelming. In other words, sometimes concise and to the point can be more valuable than masses of information. And then when you're ready, you can come back for more! This gave me an idea... What if I chose what I consider to be the very essence of Boston tourism and separated it out into an easy-to-download Boston travel guide eBook. Something that could be read in one sitting and could be referred to over and over as desired. So, that's just what I did. And the result was my first eBook: "Boston Tourism Essentials: The Must-See Sights You'll Love." In just a few moments you can get your hands on what I like to call my ‘secret weapon’ designed to help you plan your Boston vacation with the knowledge that you're going to see the sights that matter most for experiencing the essence of Boston tourism. You are so busy day-to-day that the thought of researching a vacation feels like drudgery. You are so focused on getting it just right that you're getting lost in the amount of information out there about Boston tourism. You're not generally a planner but thought you should have at least a vague idea of what Boston has to offer. So, you're here to get a brief overview and a few good tips for your time in Beantown. You only have a short time in Boston and want to use it to the max. In any case, you need solid information and there's a good chance you need it quickly. You are looking to create an awesome experience for yourself, your family, your friends or your colleagues and you want to make sure you don't miss out on anything important. What are the most important historical sights to visit? What are the top Boston museums? What makes Fenway Park so special? What's the best way to get around Boston? 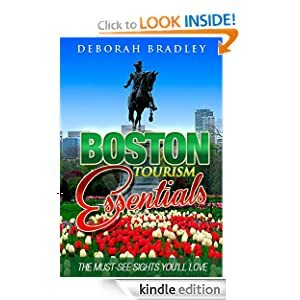 We're excited to announce that Boston Tourism Essentials is now available in Kindle format at Amazon.com! FYI, you can read Kindle books even if you don't have a Kindle tablet. All you need to do is download the Kindle app for your smartphone, tablet or computer. To Get Your Boston Travel Guide! I hope you love Boston as much as we do!